I Skate, Therefore I Am: Who's Hot? Daniel Cuervo the "Crow" from Dominican Republic! Who's Hot? Daniel Cuervo the "Crow" from Dominican Republic! Daniel Cuervo belongs to that new generation of skater who rides vert with purpose, force and determination. He should, he can only do all those things through Christ. With Edixon from the Dominican Republic, the Cuban bros Miguel, Luis & Jefferson and the legendary skater “El Ché” (Alejandro Pando Napoles), Maroña’s last project was to build a ramp for Red Bull Sport Project in Cuba. The project was largely covered in several skateboard magazines, in a movie, and was a first for Cuba. 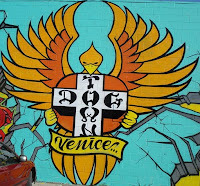 I met him in the heart of Dogtown, in Venice Skate Park. This is who he is in his own words. Daniel Cuervo: My name is Daniel Cuervo. I am 19 years old. I am from Dominican Republic. I started skateboarding about 7 years ago. 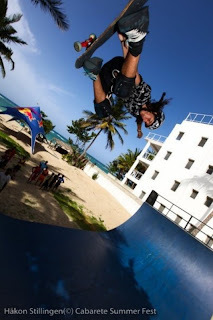 The first time I skated was when one of my friends brought me for the 1st time to a ramp where they were hosting the Dominican Republic National Championship. The national champion at that time was Iván Maroño (Maroña), I saw him skate and I felt compelled to skate. I said “I want to follow his paths”. Then, Iván just taught me how to skate. When did you get your first skate? Daniel Cuervo: My mother bought me the 1st one, then, Iván Maroño had a skate shop and a skate park and he started to sponsor me and he gave me my first skates. 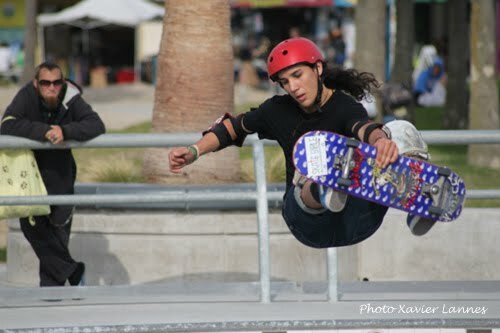 Why did Iván Maroño close the skate park? Daniel Cuervo: Because he now lives in Spain. I have heard you are one of the best in Dominican Republic? Daniel Cuervo: I am the National Champion. There are contests all the time and this is my 3rd year as #1 in Dominican Republic. But I’m not pro yet, I ride as an amateur. You also participated in contests outside of Dominican Republic? Daniel Cuervo: In 2007, I went to Vancouver for Gromfest and I ended third. I went to the same contest in 2008 and I ended 3rd in bowls and 1st in Best Trick. I also went to Puerto Rico but there I could not win because I broke my wrist. I also went to the ASR, last week (Feb. 3-4th) in San Diego. I could not do the final because that was a “best trick” contest. That was my first real amateur contest in the US at an international level and the level was very high. So you came to California for the ASR contest or for vacations? Daniel Cuervo: What do mean for vacation? I came to skate. I came for the ASR contest and also to practice, to be confronted with people with better level than mine and eventually find a sponsor. Where do you stay here? Daniel Cuervo: I live at Heidi Lemmon’s house. She is the president of the SPAUSA. Daniel Cuervo: No, I take my skate and just arrive in no time. Daniel Cuervo: Tropical Skate made the contact for me. We are part of the Skate Park Association of the United States, so they told her that in order for me to improve, I had to go to the US, be with amateurs and pros. Is this the first time you come to California? Daniel Cuervo: Yes, that’s the 1st time here in California, but I already went to Miami and New York. In Miami, there are lots of parks and in New York there are several parks, but it’s not like in California. In California, I only know Venice and San Diego. 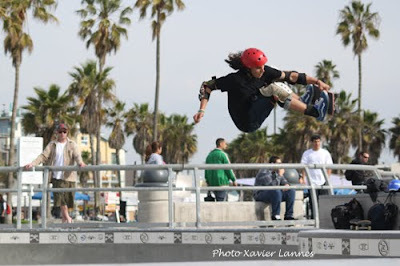 I want to go to Vans skatepark, y bowls in Santa Monica y several other parks in Southern California. 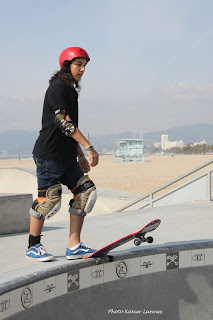 Daniel Cuervo: I skate 4 hours everyday. What contacts do you have with Ripper? Daniel Cuervo: I am trying to get a sponsorship from them but still, there is a lot to do. Daniel Cuervo: That was another sponsor that I had in Dominican Republic but now it’s over. Daniel Cuervo: That’s the company that’s upholding skate in Dominican Republic. They are a skateboard school and I am the teacher of the school. Right now, they are sponsoring me. They are the ones that sent me here in California, with God’s Will. Are you more street or vert? Daniel Cuervo: I am definitely vert! Ramps, bowls, vert! 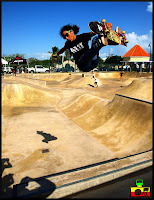 I though you do not have skate parks in Dominican Republic? Daniel Cuervo: We don’t have anymore bowls, but every time I can go outside of Dominican Republic, I take advantage to go to a skatepark. You have an amazing vet level for someone that’s not skating with the proper infrastructure. Daniel Cuervo: I think I was born to do vert. Also, we have a mini ramp so I am used to vert. What is new for me is curving because we have no bowls in Dominican Republic. But with only one week at Venice and I think I’m OK.
How long will you stay in California? Daniel Cuervo: From January 12th to February 28th. Daniel Cuervo: Because that was the start of the vert and the start of skateboarding! All of this is Dogtown, so here it’s like paradise? 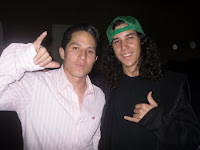 You skated with Christian Hosoi, can you tell me more about that? 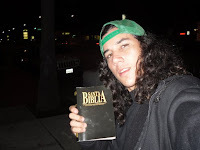 Daniel Cuervo: I met a Christian fellow from the Skate House and he invited me to Christian Hosoi’s church in Westminster. There I met Christian, he is a Pastor at that church. 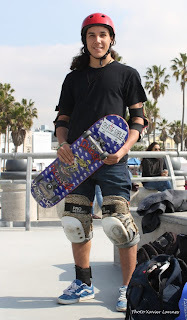 I just asked him if he wanted to go skate with me and he said “sure” and the next day, we were skating both of us here in the Venice Skate Park. Then, I saw him again at the ASR and now we have a relationship that is based on friendship and I feel like Christian is my friend. 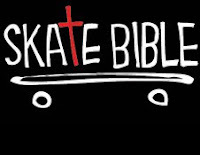 Daniel Cuervo: I am a Christian skater. I started to be involved in Christianity when I was about 14 years old. I feel the only hope that someone have in life is through God. God is telling you what to do. When you dedicate so much time to God, you see that God must go before everything else….. 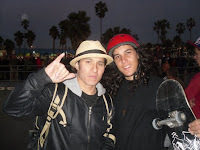 So, between Christian Hosoi and God, how did you feel at The Sanctuary? Daniel Cuervo: That was awesome! 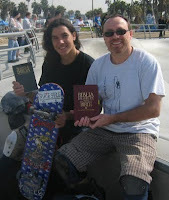 Christian Hosoi is one of my favorite skaters; Christian, (with Jay and Brian) are using their skateboarding talents to spread the word and the Gospel, to preach and evangelize and to bring God’s words to the all the skaters. Daniel Cuervo: Of course I like to watch it a lot, but I could only see part of it, not all. Let’s see how well you know the bible. I am going to tell some verses and you tell me where they are from. “He blessed the seventh day and set it apart as a special day”. Daniel Cuervo: This is from Genesis! “For you are great and do marvelous deeds; you alone are God”. Daniel Cuervo: Chronicles? No, Salmo! Daniel Cuervo: Philippians 4:13. That’s my favorite verse from the Bible because every time I am thinking about Jesus I think about that everything that I do, He helps me doing it …. I see that nothing is impossible for God and that He can do everything that He wants with us, so, every time I go to a contest, every time I see something that seems difficult, I think: “I can do all things through Christ which strengthened me”. “You are forgiving and good, O Lord, abounding in love to all who call to you”. Daniel Cuervo: Don’t tell me… I know it, I know it! That’s the verse I have in my Facebook page. I’m glad you trusted Him. How about ‘Blessed is the man who persevere”? Daniel Cuervo: That’s so true. Like the Bible says: God did not create the world in one day, so one must give time to time. God is not going to bless you with one trick just like that! God wants to see you persevere before He awards you with the blessing of the new trick. Daniel Cuervo: First I want to thank God for giving me the opportunity to come to California and to show my strengths and potential. I also want to thanks “Tropical Skate” in Dominican Republic, my mother who is 100% behind me and because she let me do what I like to do, she knows how to mentalizing that this is my career because I am taking skate as a career and not like a game. I also want to thank Heidi Lemmon because I’m staying at her house and she is also giving me 100% support. That’s amazing what she has done for me. Not everybody lets you in their house; she told me “you can stay there 2 months if you want”. - Competencia Amateur Gromfest 2008 Vancouver (Canada) 1er lugar Best trick all park, y 3er lugar en Bowl. - Competencia Amateur Gromfest 2007 en Vancouver (Canada) 16,17 y 18 de julio. 2do lugar en Bowl. 1er. lugar Cat. Open, rampa. 2do. lugar. Cat. Open Mini rampa. 1er. lugar. Categoría Yunior. Mini rampa.